A new sandbox MMORPG world with the atmosphere of modern gothic and punk, vampires and other supernatural creatures. Dogma: Eternal Night is a sandbox MMORPG, where you will take on the role of a vampire and, like other supernatural entities, try to survive in a modern megalopolis. You will become one of the non-living and join a vast community of those who dwell in the night and conceal their existence from mortals. Thousands of players online, all on one server. Cities and monuments, adapted from the real world. Dynamic environment - your deeds can influence others, as well as the world. No Boundaries - develop your character the way you want. There are no class or level restrictions. Plenty of opportunities for social encounters, allowing you to establish contacts, intermingle with other players and make deals with your enemy. The possibility of death will keep you on edge and force you to carefully think through your actions. Live in-game events. Bringing the players and main story-arc characters together, whom you know,love and possibly hate from the Dogma story while encompassing all facets of the MMORPG world(PvP, RP and PvE). The team has been inspired by games such as EVE Online, Secret World, Assassins Creed, Batman Arkham series and many others. We've incorporated elements of advanced social interactions between players and NPCs, unrestrained movement around the vast cities, and also tried to preserve and recreate that unique gothic/punk style of the universe. The world of the undead goes to great lengths to hide from the eyes of mortals. This immortal society has existed for centuries but it is in a vampire’s nature to resist attaching themselves to any kind of organization or ideological concept. As time passed, only four large organizations have emerged. Kindred prefer to call them the Sabbaths, in memory of the Inquisition mistakenly identifying vampire gatherings as witch conclaves. Domini is the high society of vampires, closely interacting with the mortal civilization and taking interest in education and arts. Out of all the Sabbaths, Domini are closest to the world of mortals: by enjoying the fruits of modern civilization, Domini truly live in the lap of luxury even after death. The Hort Packs follow primitive rules of survival and natural selection, preserved since the ancient times. This age-old existence means that there is no need for any sort of intricate hierarchy, and the undead Hort either roam the world alone or band together into small families with nominal leaders and hermits. Like hungry city vultures, they wander through the slums, looking for prey that strayed from its flock, hunting even those tainted by illness or food poisoning (the Hort are not fussy about their food). Meanwhile, labyrinths of the city alleyways hide their lairs, silently bearing witness to the primordial rituals of the Packs. The Orthodox Theocracy is a conservative religious organization; a sovereign church-society lead by a Holy Crown. The undead Orthodox believe in their kindred bond with the Maker, which is upheld with bloody offerings. They build a society where mortals are sacrificial lambs and their immortal shepherds take their rightful place according to the will of the Maker. The Theocracy presents a possibility of a natural reconciliation with your predatory nature not just for everyone who joins its ranks, but for believers from other societies as well. As such, it is seen as a righteous path by many vampires, since it not only justifies the process of hunting (and the vampires’ attitude towards mortals as feeding vessels), but also sanctifies it. According to the Maker, their purpose is to feed Him and all of His virtuous children. The CRUOR Corp is a global corporation, established during the times of industrial revolution, known to mortals as a sole monopolist-owner of large companies that make household appliances, food and pharmaceutical products for mass consumption. Amongst the undead, CRUOR is known as a society of immortals who delved into the secrets of the blood, and its influence and effects on the objects both living and inanimate. By practicing Theurgy, ritual magic, vampires slowly change the consumers and few immortals can predict the consequences of these experiments. Controlling the character is done by combining the targeting system and mouse-look – you can either use mouse and keyboard, or a gamepad, like in many 3rd person action-adventure games. These controls let you freely move around the city and climb the rooftops, implementing a parkour-based movement system. You can control the camera with a mouse or gamepad analog stick. Combat is done in action mode – by aiming with the mouse/gamepad, you can use hand-to-hand attacks, firearms or special powers. You can also switch to the aiming mode, either to increase the effectiveness of firearms, or to lock onto target for hand-to-hand combat. The character always maintains their freedom of movement. Vampires are supernatural creatures, but their bodies are not. Abilities grant massive physical and spiritual power, allowing you to change your body or affect the items around you, but they don’t make the Kindred all-powerful. Vampires aren't capable of true magic, their abilities are just brute force. Sharp fangs and teeth, the might of 10 people, mind control or ritual witchcraft – this is the extent of the most common vampiric powers. Our main task was to create a flexible system of creating and combining various skills while their effects can be positive, negative, or mixed. For example, nobody will stop you from getting an ability that is both offensive (by inflicting damage) and influencing the enemy (or your character) by applying various effects. This type of combination will allow the character to create a large variety of combat skills, accompanied by diverse visualizations. In the future, we will expand the list of possible Abilities and implement special skills that have their own unique effects and aren’t tied to the main combination chart (or have only partial connection). In this game, you can permanently lose your character. In order to track your character’s well-being/sanity, we have created an indicator that changes every time the character commits these deeds. But don't worry. This is only a last resort and I doubt most of you will experience death for yourself. Eternity is waiting for you. The city nightlife is centered on numerous night Establishments. These places are the most important part of the gameplay; they are centers of the nominal city districts they influence. As a player, owning an establishment will increase your influence and the range of your territory. When visiting establishments, vampires can access the Black Market, make business deals and interact with mortals. The game is based on the principle of free trade; any item can be put on sale on the Black Market. Just visit an Establishment, register the trade offer (indicate the price and the length of the auction) and pay the tax set by the owner of the Establishment. Potential buyers, interested in your item, will pay the necessary sum and will be able to pick up the item from the chosen location. Market interfaces are available in every Establishment and will show offers from all around the city; however, you will have to pick up the item yourself. Things can be created with mortals. By using their skills, your mortal servants can gain the trust of certain representatives of large companies or corporations. After establishing these connections, you can manufacture your own goods through their companies. By having necessary materials and components, you can order the manufacturing without raising any suspicion. However, while you will be manufacturing large quantities of goods, you will not be able to lay your hands on all of them, as this might draw unnecessary attention. This is why the items produced for your own needs or the Black Market will be sent one piece at a time or in small installments. Finally… we understand how hard it is to spend a lot of time in the game and it’s even more difficult for those who don’t have that much free time to begin with. We will try to solve this problem by developing online/mobile services and API so that the players can get access to a limited number of game features, even if you don’t have a game client nearby. Mobile apps and web-resources on smartphones, tablets and browsers will allow you to make deals, control your mortals and exchange emails and messages. Our soundtrack is the part of our game that we particularly like and therefore pay a lot of attention to. We've communicated with many musicians and composers to create a unique soundtrack for our game. Among them are famous Russian composer and sound designer Misha Dioxin, and musical projects such as Chiasm, Project Hypoxia and Darkmind Project. We have spent more than a year developing the project in our free time and in the last couple of months, we have received a lot of positive feedback about our work, both from our Russian fans and from abroad. Now we’re finally ready to realize our dream. The team has almost finished working on a prototype. Movements, interactions with objects and opponents, mechanics of various locations and the ability to travel between them, and so on. We are still working on various other models and lore. Now we hope to turn this into a full-fledged game. However, we are an independent company and would like to keep it that way. We don’t receive any sort of external financial support and the costs to create new content and improvement to existing work will keep increasing. The team needs expensive equipment, software, a lot of effort from the artists, designers, programmers, and a lot of time as well. We need to create new animations, better textures and effects, tweak the game balance, and put in new content along with other exciting game possibilities. Out of all of this the team could only do it with the help of the community. With your help, we can finally make Dogma our number one priority and put all our time and effort into it. Collected funds will be put into necessary tools for our team and we will be able to take up development on a scale of a full-time job, or even longer, if that’s necessary. 1. TEAM SUPPORT - allowing us to finally focus on the project full-time or longer. 2. SERVERS - Purchase of powerful server components and their placement in the best data-centers we can get. This will ensure stable connection, quickly connecting thousands of players to the game. 3. EQUIPMENT - Buying (or renting) powerful state-of-the-art equipment will make the set goals easier to achieve. We will be able to create (and later, demonstrate) quality environments, realistic character models and breathtaking effects. We are planning to get one of these. Xsens MVN will allow us to create extremely high-quality animations for your characters. 4. SOFTWARE - Development of any product requires professional software. Your help will allow us to acquire the best tools to create the best graphics, gameplay and maximum client and server optimization. 5. LORE AND STORYLINE - We are building a large universe with advanced storylines, but this requires a lot of effort from our designers. Your funds will allow us to hire more professionals to make this part of the game better and even more interesting. 6. MUSIC AND AUDIO - Atmosphere, music and sound effects are an important parts of our vision. To create that, we will need quality equipment and partnerships with recording studios. Furthermore, we want to hire professional musicians for some parts of the soundtrack. 7. CHARACTER DESIGN - Character appearance and clothing are one of the most important parts of the game. We put a lot of effort into creating clothing and accessories but we want to give you guys even more. This reward will be available to everyone who supported the project with any sum. We will put your name (or nickname) into the “Thanks” section of the credits, as well as on our website and social networks. This reward will be available immediately after the end of the campaign. Special forum badges on our official website. There are 5 types of badges, depending on how much you pledge to the project. These badges will make you stand out among other forum users and they will be available immediately after the end of the campaign. In-game bonus for your character – depending on how much you pledge to the project, a special set of clothing that will make your character stand out and highlight your status, private apartments in the center of the city you selected, you don't have to buy it in the game and no one does it before you. Finally, you will receive your own residence, a mansion. We will talk more about these rewards in the updates. Our pledgers will receive these rewards once the game is released. Another reward for everyone who supports our project. This is a set of five full-sized pieces of concept-art which we will send you to be downloaded digitally. The set will be based on the official works of our artists. We will prepare this set soon after the completion of this campaign. This is an official digital edition of our soundtrack, containing main tracks from the game. It will include the best tracks created by composers and musicians with whom we collaborate or will collaborate in the future. The creation of this soundtrack will take some time. Therefore, we plan to give you this award during the alpha or beta testing. Our official invite to be the first one to join the society of the undead. You won’t need to buy the game separately, everyone who pledged $25 (or $20, in case of a limited offer) or higher, will gain access to the game a few weeks before its official release and 3 months of free access to the full game without restrictions after release, which is planned to take place in 2017. In addition to the previous reward, you will also receive an invite to one of the phases of the closed beta-testing. The phases you’ll be invited to will be decided by a random draw, as we will be working to ensure the stability of all systems. We plan to start beta-testing our project as early as 2017. Once in a lifetime chance to become one of the first Kindred. The phases you’ll be invited to will be decided by a random draw, as we will be working to ensure the stability of all systems. We hope we will be able to reach the first alpha release in the fall of 2016. Have you ever wanted to use your favorite name in an MMO, only to find out that it was already taken? Now you will have an opportunity to reserve it for our game and nobody except you will be able to use it. We will prepare several exclusive DVD-box sets of the game, developed for this campaign. Inside you will find two discs (containing the game and the soundtrack), and some additional bonuses, along with a thank you from the team. All of the production and shipping costs are on us, you will be able to receive the reward close to the release date. You will receive a colorful artbook full of concept art from our artists. Glossy pages bound in a hard cover include all the details about the game universe and will be a great addition to your collection. All of the production and shipping costs are on us, production of the artbooks will begin after the game’s release. Owners of this reward will be able to take part in further world-building. We will be creating game content based on your sketches, photos or descriptions. For example, this can be a building, a special set of clothing, your own statue, a new NPC or a street sign named after you. We will add more, if you reach the maximum. Prelude Games Factory is a young team of developers, formed in April 2014 with a goal to create and develop a setting called Dogma: Eternal Night. Our team has members from post-soviet countries, such as Russia or Republic of Belarus, as well as those from numerous other countries from around the world such as the United States. The most important tenet our team upholds is “for the fans, by the fans” and each and every one of us are, first of all, a part of the gaming community and secondly, we’re then developers. The idea to create the team and the project first appeared at the end of 2013, as the rumors about the cancellation of a well-known IP began to circulate. As cancellations for many promising games happened, in April 2014, the members and the administrators of a Russian community decided to join forces and create their own game. Game development is a difficult and risky endeavor, and Massively Multiplayer Online games are among the most challenging. The Dogma: Eternal Night team, led by Denis "AiryKai" Petrov, consists of some of the most passionate developers, gamers and professionals in world. All time lines have been planned and estimated as well as possible internally, however game development is an iterative process and this means that schedules cannot always be guaranteed. This includes release dates for stages of development, betas (internal, Alpha, etc). - We will use ALL of the funds raised to directly further the development of Dogma: Eternal Night. - We will do our best to deliver each stage of the game on time and with the highest level of polish possible. - We will stay in constant communication with you, our community, to let you know of changes to our content, features or schedule. This can be already seen on our social media platforms as well as our forums. • Includes everything from the $750 tier! 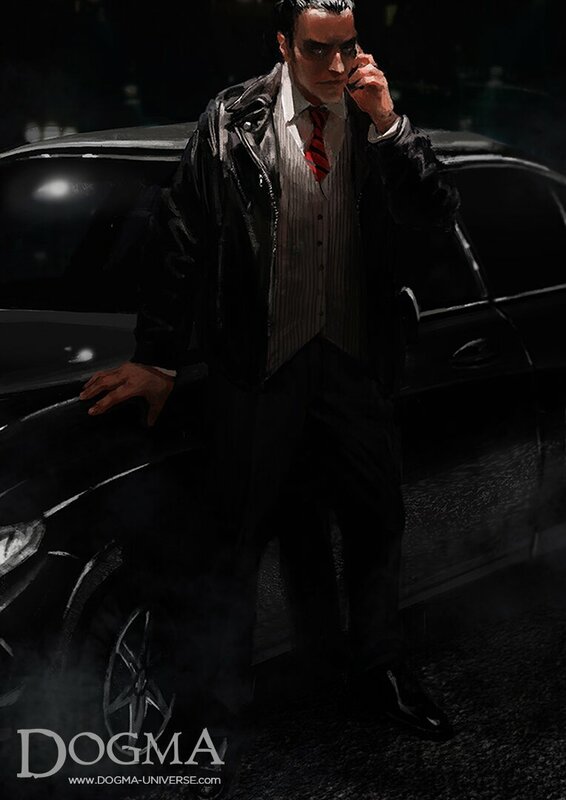 • We will add your image (photo, illustration or a character image) on Most Wanted posters on the streets of the game cities. • In addition, we will add your name in a special "Most Wanted" section in the credits.